Regularly $19.99, on sale for $9.99. Sorry, all I know is the USD amounts. 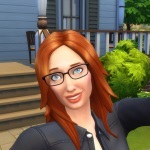 Check out THIS section of the Sims forum. There are a lot of tips and videos on how to build. You can ask questions about building. And there are simmers there who will even build you a house exactly like you want it! I've not built much. I'm still enjoying remodeling all the EA houses that come with the game. There are soo many! I still need to post the remodel pics of the little prefab house. I had the post all ready to go and somehow lost it. I haven't had the heart to go back and do it all over again. On the left is why some people think S3 sims are ugly. On the right is why they're really not! No facial sliders used. I only changed her weight and her makeup. Oh, and her clothes of course. Because whoever put that outfit on her was just MEAN. I'm still trying to recreate my SFP town in Sunset Valley, but branching out a little to have a look at some other worlds. It's so much fun to go to other towns and look around at the sims and scenery! I bought Island Paradise quite some time ago but haven't installed it because everyone talks about how 'glitchy and unplayable' it is. Due to some postings over on the Sims forum giving instructions on how to clean up some of the glitches, I installed it. Beautiful!! And it has some really nice hair and clothes selections. Here's the instructions to clean up the game anytime you want a new game in this world. I'm going to need them again too. Fix the front door on the Collins and the Adobe homes. Interior doors are set as front doors. Look around the town for other ones like this. Fix the toilet at Rubisel Ictacha's houseboat. It's not reachable. Again, look around the town for other ones like this. Add NRaas Register mod to keep the game from spawning thousands of unneeded NPC characters. At this point the game finally started playing for me. But just in case, if still glitchy delete The Romantic and The Prince homes. If you want the whole discussion go to the sims forum and read the experts comments in STILL AWAITING FOR EA TO FIX SIMS 3. When I find additional errors I'll add them here. I'm looking around at all the houses now. View from the Beach Babes' house! If I remember correctly, if you don't keep at least one Sim somewhere in town, it's flagged as ready to be reset. Having said that, I also remember a separate third party world editor/creator (I think on carls-guide's site) that allows you to make completely new worlds based off an existing one. Mind you, I haven't done this in years, so I'm not sure about any details any more. My memory isn't very good. Thanks for that explanation, Cathy. There are so many worlds out there that people have created, spoiled for choice! There are some really amazing beautiful ones. I'm still learning the EA worlds but I've downloaded a few of the player made worlds because I'm afraid they might disappear eventually. What I'm learning is that there are simmers out there who have been simming for YEARS and are still learning new things about Sims 3! So much to learn, so little time to play. I saved up my ad watching points on the Sims 3 store and bought a washer and dryer. Big mistake! When you put a washer and dryer in the house sims discard a pile of dirty laundry on the floor when they go to bed. And it stays there until someone comes around to pick it up, put it in the hamper and do laundry. I hate having dirty laundry piles everywhere so I put a fake washer/dryer in my laundry room. No more dirty piles. Might be nice to do if you have a frat house or something, just saying. No pictures for a while. My picture editing app that I was using to shrink my pics down to a suitable size has an update but my computer won't let me update it because I don't have a hotmail account sign in on this laptop. And I can't use the app until I update. Since when do you need a hotmail account to create a computer account??? Since Windows 8 I guess. ZeeGee wrote: What I'm learning is that there are simmers out there who have been simming for YEARS and are still learning new things about Sims 3! So much to learn, so little time to play. I did like it for small households, but it does get tedious at some point. I guess it suits those who want more realism in their game. ZeeGee wrote: No pictures for a while. My picture editing app that I was using to shrink my pics down to a suitable size has an update but my computer won't let me update it because I don't have a hotmail account sign in on this laptop. And I can't use the app until I update. Since when do you need a hotmail account to create a computer account??? Since Windows 8 I guess. They (Microsoft) did that so you can keep your settings and stuff (including Office license) across devices. Windows 10 has improved a lot of the issues that 8 has, but still requires a microsoft account (which doesn't have to be hotmail, any mail account will do as long as you register it somewhere with microsoft). I use a gmail account for the Technical -now Insider- previews of windows 10. As for a decent but free picture editor, you might want to check out Paint.Net (which is what I use all the time). It also has tons of plugins, if you take a moment to search for what you need on their forum. Again, all free and no account required. Okay, I get it now! I was confusing 'hotmail' account with 'microsoft' account. So a Microsoft account will be like an Apple account now. That makes sense. Sorry for the Windows bash. Yes, they are copying Apple but that's a good thing, lol. Thanks again for helping out the technologically impaired, Cathy. I think I dissed the Sims 3 Store in a previous post. I was under the impression that most of the content would be similar to the ugly stuff in my base game. There is actually some amazing content on there. There is a whole subculture built around 'owning the store' and getting content at a discount through the daily deal. So I'm now clicking ads for free simpoints and stalking the daily deal. I recently got 'Boardwalk' from the store on daily deal and it's fun! Zarabeth called off work to go ride the new rollercoaster and ran into Jamie Jolina, a townie who evidently had the same idea! Last edited by ZeeGee on 01 Jul 2015, 06:50, edited 1 time in total. GAAAAAH! As if vampires don't freak me out enough, to have one appear out of the blue is downright terrifying!! My knee jerk reaction was to totally annihilate his vampire self, but I worked so hard on him and he looks exactly like I think he should (he's Win Lockwood, Myron Bolitar's sidekick from the Harlen Coben series). So I took him into CAS and after much searching through skins and accessories, finally figured out that there is a built in option in accessories to add vampire teeth. It doesn't make them a vampire, just gives them the dentition. I guess I accidentally clicked it in my sleep-deprived state. It just shows a mouth so I've not ever even known what it was!! So here is Win in all his glory, sans vampire teeth.